ComMUnion will bring an opportunity to put together all the expertise of 15 partners to develop a breakthrough concept applied to 3D metal/thermoplastic joining. The figure below shows the European map distribution of the ComMUnion consortium. AIMEN (Coordinator) is a non-profit private association, founded in 1967 and based in Spain, whose prime objective is to develop and increase technological competitiveness and innovation capacity of companies. AIMEN provides industry with technological services and RDI activities focused in wide range of sectors. AIMEN is constituted by 110 companies, which supplies technological support to more than 400 companies dedicated to industrial or commercial activity related to metallurgy, automotive sector, civil construction, mechanics, shipbuilding, chemicals, foundry, machinery, ceramics, food, cement, wood and its derivates, plastics, engineering, assembly and others. AIMEN promotes and undertakes research, as well as improves design, simulation and joining technologies. Gestamp is a multinational group dedicated to the development and manufacturing of metallic components and assemblies for automobiles, with a physical presence in 22 countries, and 95 productive plants, that offer employment to more than 25.000 people. Autotech Engineering A.I.E. is an economic interest group belonging to Gestamp. It was founded at the end of 2002 to group the R&D activities of Gestamp. Autotech provides and offers to its clients, products and technologies that have a positive influence in mass reduction and environmental care of the vehicles, and also in the improvement of the crashworthiness of vehicles and occupant protection. The company offers to its clients the complete service of design and innovation relative to the following products: chassis components (sub-chassis, suspension structural parts), BIW components (IP support, bumper beams and shock absorbers, doors & hood/boot, pillars, door side impact bars). Additionally, Autotech Engineering collaborates with its clients in the development of advanced technologies, profiles, laser welding. AHSS stamping, press hardening and hydroforming. AFPT offers special purpose machinery for the automated laser assisted production of thermoplastic composite parts. AFPT delivers both tape winding and tape placement equipment. With the equipment, customers produce mainly rotationally symmetric parts such as bearings, seals, tubes, pipes and pressure vessels which can be manufactured without thermal post-processing. Enormous economic potential is provided by omission of the earlier necessary high manual labor and the associated costs. Our equipment and parts are used in aerospace, automotive and oil and gas industries. AFPT is certified according to EN ISO 9001:2008. New Infrared Technologies (NIT) is a privately owned manufacturer of infrared sensors and cores locates in Madrid (Spain). NIT is a leading company in design and manufacturing uncooled high speed medium wave (MWIR) cameras and sensors. All NIT devices, including focal plane arrays (FPAs) are manufactured using vapour phase deposited (VPD) lead selenide (PbSe) technology, which makes possible to offer high performance/cost ratio products. Today NIT is the only company in the World able to design and manufacture PbSe imaging FPAs monolithically integrated with their corresponding Si-CMOS read out IC. NIT manufactures a whole line of products based on self designed, self produced single element, linear arrays and imaging FPAs. The company delivers customized detectors and cameras to adapt their standard products to customer solutions, adding their requested functionality. NIT´s camera cores show a great performance, achieving over 10 KHz, the fastest detection rate of a MWIR detector working in uncooled operation of the market. Leading company in Non Destructive Testing, TECNATOM Group entered the aerospace industry more than 10 years ago and has successfully positioned itself as a benchmark in advanced engineering and inspection services, providing its technology to world’s prime OEMs and top level suppliers. The company has developed state-of-the-art systems for ultrasonic inspections of aerospace composite parts. This powerful HW-SW technology enables the integration of the complete inspection process: teaching-probing, scan path generation, post-processing, 3D simulation, acquisition, evaluation, reporting and auxiliary devices in a unified environment that can be operated only by a single person. -Robotic inspection systems for aircraft component testing based on articulated robots with multiple configuration possibilities, providing more flexibility, accuracy and productivity to detect possible defects in the material. -Portal gantry type for large flat and curved components using different ultrasonic inspection techniques: water jet through-transmission and pulse-co, both in contact and local immersion. -Non-contact inspection systems, based on air-coupled ultrasounds or by means of laser. -Semi-automated systems or manual acquisition systems to complement automated inspections providing permanent recording and position for specific areas or maintenance activities. Motofil Robotics is an European machine tool builder and robotics integrator able to provide our clients with highly reliable and productive solutions, anywhere in the world. This ability results from the technical team with vast experience in robotics, industrial automation and processes together with a broad range of standard systems and a great capacity for developing and manufacturing of special solutions. Philips Photonics is the leading innovator in VCSEL based infrared laser systems, developing and manufacturing devices, modules, systems and applications. Its focus is development, manufacturing and marketing of VCSEL components and higher value-add modules and systems based on VCSELs. Philips Photonics develops optimal solutions tailored to the specific needs of the process, in close collaboration with customers. Products and solutions are based on Philips’ comprehensive know-how in technology, design, quality and production and a strong network to leading suppliers and scientific institutes. The Fraunhofer IPT develops systems solutions for production. We focus on the topics of process technology, production machines, mechatronics, production quality and metrology as well as technology management. With more than 250 employees and 10,000m² of usable floor space the Fraunhofer Institute for Laser Technology (ILT) is world-wide one of the most important development and contract research institutes of its specific field. The activities cover a wide range of areas such as the development of new laser beam sources and components, the use of modern laser measurement and testing technology and laser-supported manufacturing. This includes for example laser cutting, caving, drilling, welding and soldering as well as surface treatment, micro-processing and rapid prototyping. Furthermore, the Fraunhofer ILT is engaged in laser plant technology and process control as well as the entire system technology. The Laboratory for Manufacturing Systems and Automation (LMS) of the Department of Mechanical Engineering and Aeronautics, in the University of Patras, Greece, is under the supervision of Professor George Chryssolouris and is oriented on research and development in cutting edge scientific and technological fields. LMS employs approximately 70 researchers organized in three different groups focusing on Manufacturing Processes Modelling and Energy Efficiency, Robots, Automation and Virtual Reality in Manufacturing and Manufacturing Systems. LMS is involved in a number of EU funded research projects in a variety of disciplines organized in different research groups. Particular emphasis is given to the co-operation with European industry. LMS performs Research and Development (R&D) work related mainly to the following areas: Innovative Manufacturing Processes Advanced Human-Centered Design Techniques including Virtual Reality, and Production Systems Planning, Control and Networking. University of Coimbra (UC) is a reference in higher education and R&D, due to the quality of the courses taught and to the advances achieved in pure and applied research in various scientific domains. The continuous technological development promoted by UC’s different R&D units addresses the challenges involved in the design, operation and regulation of technologies, bringing together researchers from different scientific disciplines with a long experience in teaching, research, technology transfer and consultancy in different areas. The Collaborative Robotics Laboratory of the University of Coimbra will provide to ComMUnion the required expertise in the different issues related with robotics, namely off-line programming, robot integration and communication with other project elements. Missler Software is a French SME with its headquarter near Paris. The company develops its own CAD/CAM software. For more than 30 years Missler software has been offering industry-specific solutions for manufacturers and subcontractors of the mechanical manufacturing industry. 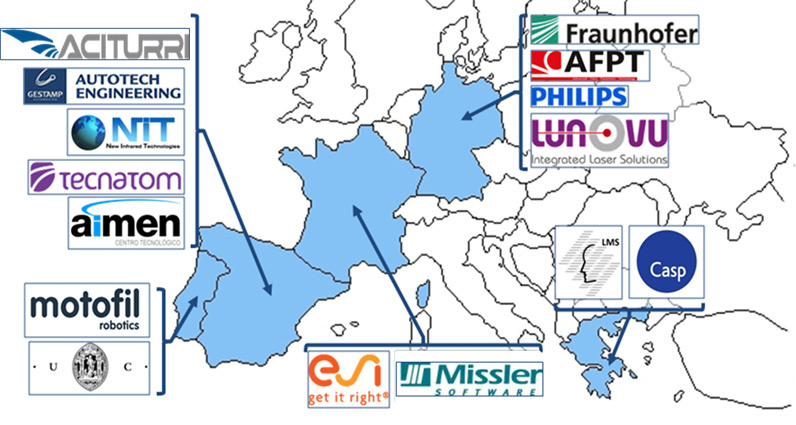 Missler Software is ranked the number 2 CAD/CAM supplier in France and number 10 worldwide (source:Cimdata). One of the main focus points of the company is the automation of the design process and the automated CNC programming in manufacturing processes. The company’s product lines is based around TopSolid with dedicated modules for vertical markets, such as mold, tool&dies, CAM, wood... Missler Software offers a uniquely integrated solution for the mechanical engineering industry (general mechanical design, special machinery, tooling, boilerwork …) and for sheet metal and wood industries. The 75 Missler Software resellers are located in Europe, Asia Pacific, North and South America. Today, more than 15000 customers around the world use Missler Software products. As an integrated CAD/CAM solution, TopSolid product enables design and manufacturing data to be linked in a given environment for very diverse fields of mechanical engineering. TopSolid is designed for all manufacturers and subcontractors that need to do major design work related to manufacturing, and to simulate and control CNC part production very precisely. ACITURRI ENGINEERING S.L.U. is the engineering company of the Spanish industrial group ACITURRI AERONAUTICA headquartered in Miranda de Ebro (Burgos, Spain) and dedicated to the aerospace market. The companies that constitute this industrial group design and produce parts and assemblies for aeronautical sector in the market segments of aerostructures and engines, both in metallic and composite materials. With over 35 years of aerospace experience, ACITURRI is nowadays a first tier supplier and risk sharing partner for the aeronautical sector employing approximately 1.070 people distributed in 4 companies, 6 production plants and 2 distribution centers in Spain. During the past years, the consolidation of new programs and the growth of consolidated programs have resulted in a significant growth of the company's economic performance with a turnover in 2014 of approximately 170 M€. ACITURRI ENGINEERING is specialized in the management of complex work packages and integrates the whole ACITURRI group engineering resources (approximately 72 people, 58 in Madrid facility and 14 in Alava). ACITURRI ENGINEERING activities comprises Joint Product Specification, Conceptual Design, Detailed Design, Process development, Testing and Certification of airframe assemblies. CASP is a software and consulting company, based in Athens, Greece, working closely with European and local industry as well as with Universities and Technological institutes, on developing and marketing Business Solutions for a wide range of industrial problems. CASP develops and markets, amongst others, business solutions for, Enterprise Resource Planning, Production Scheduling, Quality Engineering, Supply Chain Management, Virtual Reality Applications and Product and Process Design. CASP provides advanced concepts and software solutions based on State of the Art tools and Technologies for Object Oriented Design and Development. Some of the tools used are, Rational Rose for software design and documentation, Interdev for ERD visualisation, JBuilder for Java code implementation, SourceSafe for co-operative / web based source code management, XML Spy for XML development, Visual Studio for C++ code implementation. LUNOVU is a German SME specialised in laser based equipment and system integration. They provide products and services in the sections "Industrial Automation" and "Machines". In Industrial Automation" the company sets up controls of machine tools and production lines. This includes the layout, the planning, the wiring of control cabinets and machine, the programming, the testing and the documentation of systems. The customers come from sectors like machine building (LUNOVU supports the machine builder in setting up, programming and service), from production (LUNOVU modernizes/replaces controls or enhances machine abilities) and from Research & Development, e.g. 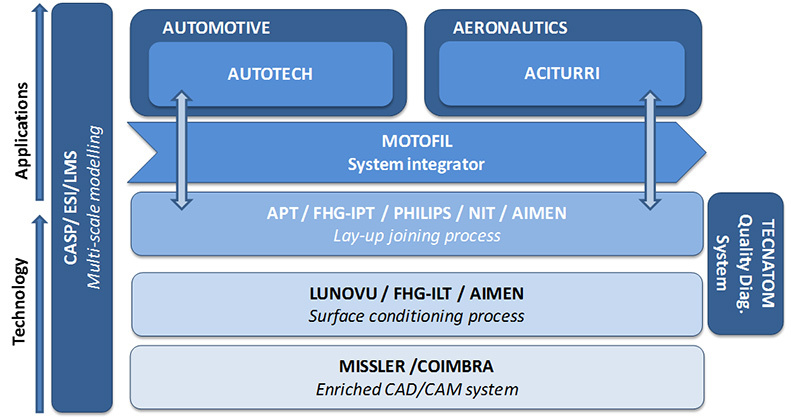 Institutes or Universities (LUNOVU designs, engineers and sets up new very specialized controls for innovative applications - always having in mind to find solutions suitable for industry). In "Machine Building" the company provides special machine tools. In this case LUNOVU works very tight with the customer to understand their needs and realize their requirements. Because of the support by Institutes and University (especially in the surrounding of the excellent RWTH Aachen University) it is possible to build up highly customized and innovative machines and components. Customers are coming from producing industry as well as from institutes. Most applications focus on realizing a new kind of laser processes or on the adaptation of existing processes to new kinds of machine tools. In the past LUNOVU was focusing on building up special machines for Laser Cladding, Light Weight Design and R2R with a high degree of automation. ESI is a pioneer and world-leading provider in Virtual Prototyping that takes into account the physics of materials. ESI boasts a unique know-how in Virtual Product Engineering, based on an integrated suite of coherent, industry-oriented applications. ESI's solutions fit into a single collaborative and open environment for End-to-End Virtual Prototyping. Moreover, ESI has experience in R&D collaborative projects, both in National and European projects dealing with software processing and virtual engineering. ESI was also involved in projects with composites manufacturing processes for both aeronautical and automotive applications. The company employs about 900 high-level specialists worldwide covering more than 30 countries.